Avvo is an online legal services advisor and marketplace that was founded in 2006. The company is headquartered in Seattle, but operates all over the United States. Their services include a database of lawyer profiles that include client reviews, as well as free consultations with partnering lawyers and a Q&A forum where licensed legal professionals will answer questions. The company offers some services for free, while others cost a small amount. Lawyers pay a fee for having a profile, and for advertising in other areas of the website. Avvo is one of the most active legal advice and review websites, so its no wonder that they can accurately claim to have a rating for over 95% of all licensed attorneys in the United States. However, being a large, active site has not kept them from falling under a lot of scrutiny. Each of Avvo’s main services has been largely reviewed as negative overall. Beginning with the Q&A discussion forum, which is Avvo’s leading free tool for users who need to get fast legal answers for specific questions or situations: This service is free to use, and is a good lead-in to Avvo’s paid service that allows users to have a 15-minute conversation with a lawyer for a true consultation. However, this free Q&A service is almost unanimously reported as unhelpful, with hundreds of users around the Internet reporting that their questions were left unanswered, or given brief and unspecific information. Avvo’s other free service is the database of client-reviewed lawyer profiles, which has been reported as untrustworthy by hundreds of clients, and unethical by many lawyers. For clients, reports all reveal that Avvo has recently begun removing negative reviews, even those that were left years ago. Customer service has been reviewed as unhelpful or completely unavailable when users tried to discover why their reviews of local legal counsel were removed. For lawyers, reviews are not screened in any way; someone who has never used your services before could leave a false review without breaking any of Avvo’s regulations. Additionally, there is no way to correct or remove any information from your lawyer profile if anything is reported incorrectly. For example, if public information has not yet caught up with your move to a new office, your Avvo profile cannot be updated by you personally. As for the paid service, which puts users in touch with a lawyer for a 15-minute consultation, this service seems to be the one area in which Avvo is not at fault for any bad experiences. They do follow through with their promise of putting users in touch with legal counsel; whether or not they do so within minutes seems to depend upon the availability of local lawyers. This small bit of hopeful (or exaggerated) marketing aside, these services are rendered as promised. 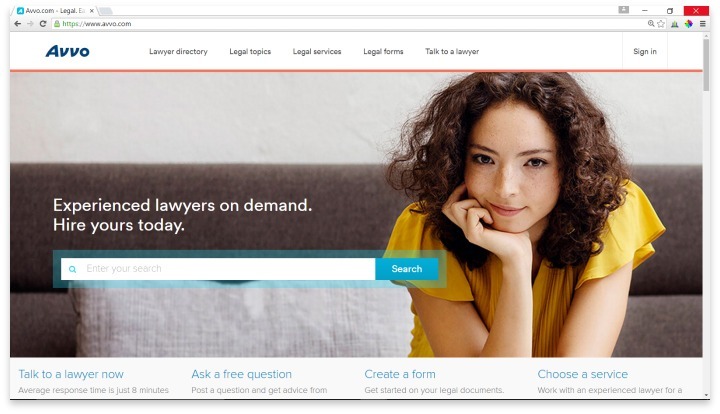 Avvo is an online legal services advisor and marketplace that has a database of lawyer profiles that include client reviews, as well as free consultations with partnering lawyers and a Q&A forum. Overall, while Avvo is considered the most active legal services website online, there is little to truly recommend it. If you want to get a good review of the legal services available to you in your area, Avvo may have the most services listed; however, you’ll have to do some additional research because profiles are not updated by the lawyers themselves. As far as Avvo’s other services, none have passed muster with over hundreds of online reviewers, so it’s safe to say that this website isn’t a trustworthy place to go for legal advice.